Smith Electric Vehicles in Kansas City! 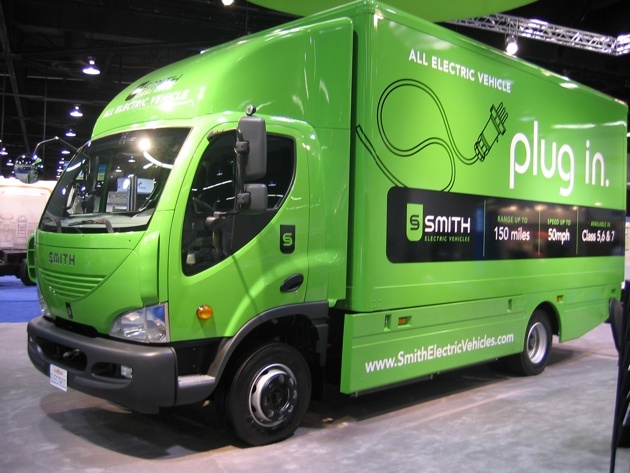 Smith Electric Vehicles has just launched low volume assembly of its Newton plug-in delivery truck in Kansas City. However, it's not clear how long Smith will keep building trucks there. Smith currently has 14 people working in a former aircraft maintenance hanger at Kansas City International airport, but only has a one year lease on the facility. Smith has yet to make a decision on a larger permanent factory. A number of other locations are actively courting Smith to build that permanent facility somewhere else. Part of Smith's ultimate decision on where to build its electric trucks will come down to where a battery plant is located. Because batteries are so bulky, manufacturers prefer to put EV plants in proximity to the batteries to minimize shipping costs. Besides the Newton, Smith is also working with Ford on the battery EV version of the Transit Connect that will be launched in mid-2010. The Transit Connect BEV will only be offered on lease to commercial fleet customers at first; volumes still haven't been announced.